Yes, you read right. Cricket. As in the bug. No, seriously. Kale, goji berries, flax seeds and almonds better make room in the superfood club, because crickets are soon to be the next big thing. Cricket flour is the powdered form of dry roasted crickets. In a ten gram serving of cricket flour you'll get seven grams of protein, leaving just two grams of fat and only one gram of carbs. Not only are they a protein powerhouse, but crickets have more iron than spinach and as much B12 as salmon (so if you're running low on B12, salmon cricket cakes need to be on tonight's dinner menu). Ok, so crickets are good for you, but they're also really good for the environment. Farm raising crickets has almost no environmental impact. As much as I'd love to keep the awesomeness of edible insects a secret, I'd also love cricket flour to be readily available and much cheeper than it currently is. Right now I have to order the stuff off of Amazon and pay a whopping ten dollars for just ten ounces. So, I'm crossing my fingers in the hopes that cricket flour becomes America's next trendy protein and grain replacement. 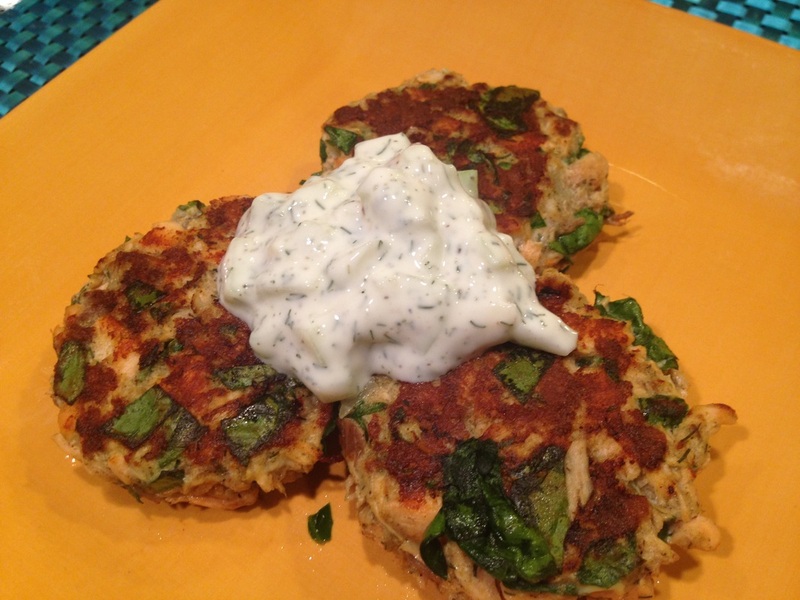 In this recipe, the cricket flour helps to bind the salmon cakes other ingredients together just like bread crumbs would in most conventional recipes. The flour has a slightly salty, earthy and nutty flavor. It's a bit grittier than coconut flour which I actually like for this recipe. Please, go to http://www.thailandunique.com and order some cricket flour. Get the smallest available amount if you're scared, but, please, try it! Just think, in almost every other developed and developing country, consuming insects is not at all considered a departure from the everyday. Only in the USA and a few Western European countries is it taboo to pop a bug in your gob. Heat olive oil in a pan that has a snug fitting lid. Add salmon to the pan over medium/low heat. Season with salt and pepper. Squeeze the juice from one lemon into the pan and cover with the lid. Allow to cook for 3 minutes (less time for thinner filets, more for thicker) then flip the salmon and cook for 3 minutes more. Remove the salmon from the pan and set aside to cool when it is almost cooked throughout, but still rare in the center. Combine the egg, spinach, onion, worcestershire, dijon, 2 cloves of the garlic, two tablespoons of the greek yogurt, cream cheese, cricket flour and 1 tsp of the dill. When the salmon is cooled to room temperature, fold it into the egg and spinach mixture. Form the salmon mixture into palm sized patties. Cook cakes on a non stick skillet over medium heat for about 2 minutes per side or until they develop a browned crust. Meanwhile, combine the rest of the lemon juice with the rest of the yogurt, the rest of the dill, and the rest of the garlic. Season the dressing with salt and plenty of pepper. Serve the cakes with a dollop of tzatziki on top.